1. Who sends quotation letter to whom in foreign Trade? 2. In which country Central Bank was established at first? 3. Which account is prepared before balance sheet? 4. When was 'Kumari Chowk Adda' established in Nepal? Mention in B.S. 5. Write the AFG No of Bank Cash Book. Answer the following questions in short. Write long answers to the following questions. a) On 2075-04-05 received Rs. 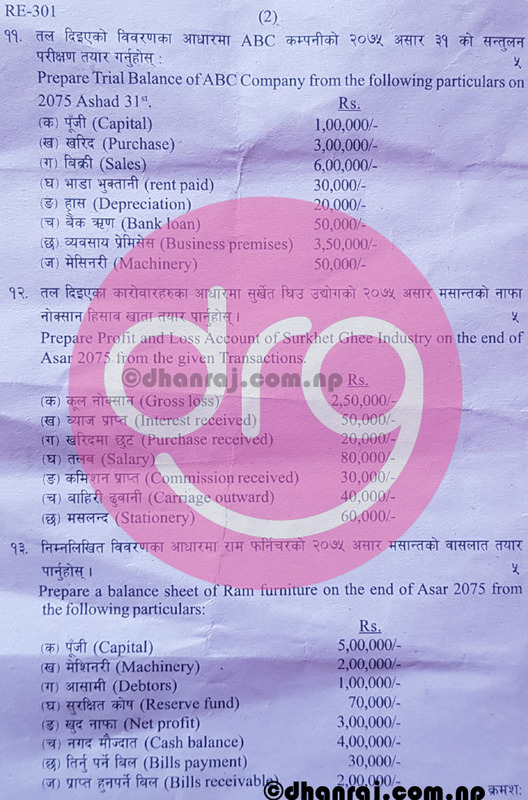 5,00,000/- as revolving fund through Nepal Rastra Bank. b) On 2075-04-10 issued a cheque no. 0956 of Rs. 5,000/- to establish petty cash fund. 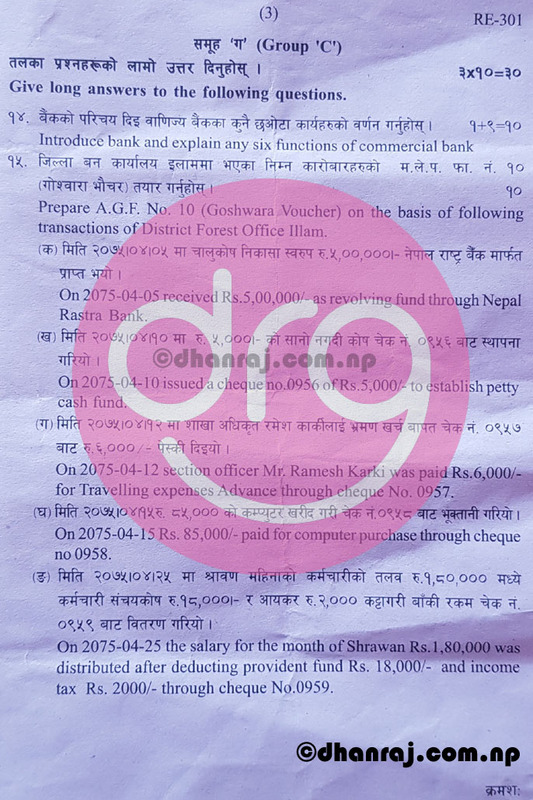 c) On 2075-04-12 section officer Mr. Ramesh Karki was paid Rs. 6,000/- for Travelling expenses Advance through cheque No. 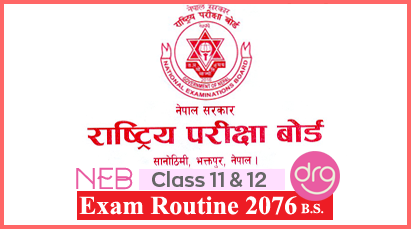 0957.
d) On 2075-04-15 Rs. 85,000/- paid for computer purchase through cheque no 0958.
e) On 2075-04-25 the salary for the month of Shrawan Rs. 1,80,000/- was distributed after deducting provident fund Rs. 18,000/- and income tax Rs. 2000/- through cheque No, 0959. 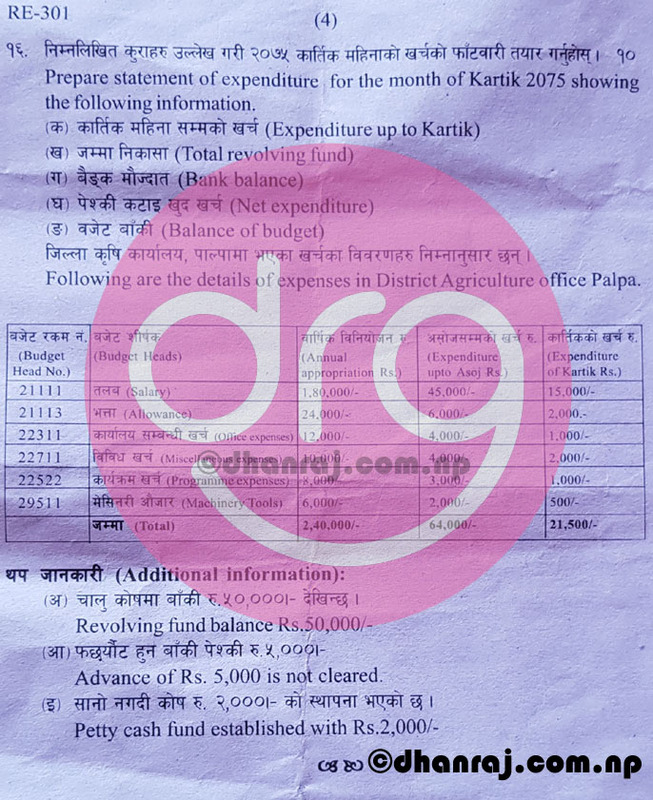 Following are the details of expenses in District Agriculture office Palpa. ii) Advance of Rs. 5,000/- is not cleared. 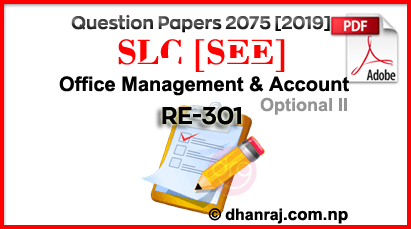 0 Response to "Optional II Office Management and Account Question Paper | 2075  | RE-301 | SEE"